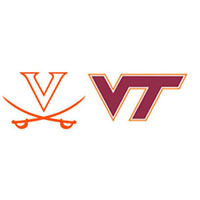 We didn’t know it at the time, but when Virginia failed to convert a fourth-and-one at the Virginia Tech 6 in the first quarter of the Commonwealth Cup rivalry matchup Saturday, the game was pretty much decided right then and there. “It was the opportunity to send a message to our guys up front that if you’re going to win championships, if you’re going to win games, you’ve got to be able to knock people off the ball and gain a yard, particularly on your favorite run play. They did a good job of defending it, and we didn’t get it. It set the tone for them to go the other way,” UVa. coach Mike London said after. Sure, it still took the Hokies the better part of the next two and a half quarters to seal the deal in the eventual 38-0 Tech victory, but the outcome was only barely in doubt following the failed fourth-down conversion. What that play did was reinforce to both sides how these games are supposed to go. Virginia Tech had won 11 of 12 in the series going in, the last Virginia win coming all the way back in 2003, when UVa. starting quarterback Michael Rocco was in grade school, the rest of his teammates aat best in middle school or just starting high school. It’s been so long that it’s hard for those on the Virginia sidelines to say they remember what it feels like to beat Virginia Tech, and for anybody on the Tech sidelines to remember what it feels like to drop one to the Cavaliers. “I appreciate their philosophy that they want to hammer you, but I also appreciate that we want to hammer them back,” said Virginia Tech coach Frank Beamer, whose team came in only a four-point favorite even with its lofty #5 spot in this week’s BCS rankings. “To come in here and be able to win in the fashion that we did – everyone that is associated with Virginia Tech football right now feels very satisfied,” Tech coach Frank Beamer said. Well, yes, but then, that’s what they expect to do. Just as the guys wearing orange and blue expect to come out on the short end of the stick when it comes to the annual in-state clash. “It got away from us early,” said senior wideout Kris Burd, who had seven receptions for 100 yards in his final game at Scott Stadium, which ended like the last four home games in the series for the Cavs. “It definitely hurts not being able to beat them during my career here,” Burd said. Of course it does. But Burd is just another UVa. senior to finish out a career against Virginia Tech without winning a game against the bad guys from Southwest. Eight straight losses is, what, now, five senior classes that can’t count a win against Tech on their college career resumes? “Whatever it is now, it’s just one more loss to them,” London tried to say after the game, but the words ring hollow even in his own ear. Eight wins, five in the ACC, two on the road at Florida State and Miami, finishing second in the rugged Coastal Division after being picked fifth in the preseason, it’s all wonderful, but this sad fact remains: I-AA James Madison owns as many wins over Virginia Tech in the past 13 seasons as Virginia does. And Frank Beamer isn’t likely to schedule JMU again anytime soon. But even if Tech were to leave the ACC for another conference, he’d make sure to find a spot at the end of the year for Virginia, at least until the program in Charlottesville can get over the indomitable boogiemen that they’ve made the Hokies out to be.